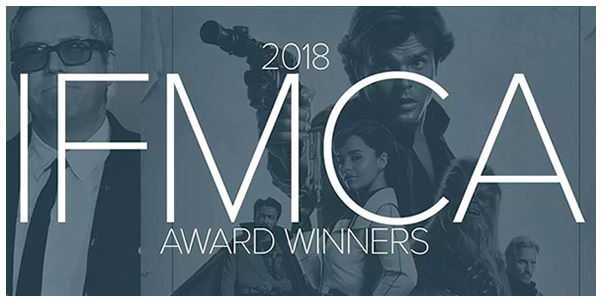 FEBRUARY 21, 2018 — The International Film Music Critics Association (IFMCA) announces its list of winners for excellence in musical scoring in 2018, in the 2018 IFMCA Awards. The score is also named Best Original Score for a Fantasy/Science Fiction/Horror Film, while John Williams’s contribution to the score, the standalone piece “The Adventures of Han,” is named Film Music Composition of the Year. These are the seventh and eighth IFMCA Award wins of Powell’s career; he previously won the Score of the Year award for “How to Train Your Dragon” in 2010. James Newton Howard is named Composer of the Year, and takes home the award for Best Original Score for an Action/Adventure/Thriller Film for his work on the controversial Jennifer Lawrence Cold War spy thriller “Red Sparrow,” for which he wrote an astonishingly powerful classical overture for the film’s opening ballet sequence, as well as some intense action and suspense music. IFMCA member Mihnea Manduteanu described Red Sparrow as “beautiful and passionate” and “melodic and furious”. Howard’s other work in 2018 was just as outstanding, and included the second Harry Potter spinoff film “Fantastic Beasts: The Crimes of Grindelwald,” and the lavish fantasy “The Nutcracker and the Four Realms,” which was inspired by Tchaikovsky’s seminal ballet. IFMCA member Christian Clemmensen called Fantastic Beasts an “accomplished and mature fantasy score” which “sits comfortably with Howard's accomplished genre works and competes favorably for a place amongst 2018's best scores.” These are the ninth and tenth IFMCA Awards of Howard’s career. He previously received IFMCA Score of the Year honors in 2006 for “The Lady in the Water”. British composer Amelia Warner is named Breakthrough Composer of the Year for her enormously impressive mainstream debut work scoring the literary drama based on the life of the groundbreaking horror author “Mary Shelley”. IFMCA member Peter Simons said that Mary Shelley was “a wonderful score … mesmerizing … unlike anything I’ve heard in a long time, if ever. The use of synth and vocals over strings and piano is just exquisite. There is always something interesting going on, either melodically or aurally … it’s one of the most exciting scores of the year”. The various other genre awards are won by Max Richter for his classically-inspired music for the historical drama “Mary Queen of Scots”; Marc Shaiman for his loving, nostalgic homage to Walt Disney and the Sherman Brothers on the comedy musical sequel “Mary Poppins Returns”; Mark McKenzie for his spectacularly beautiful, reverent score for the Mexican animated film “Max and Me”; and Pinar Toprak for her broad, adventurous, expansive orchestral score for the yacht-racing documentary “Tides of Fate”. With this win Toprak is now the only person with more than two IFMCA Award nominations to win every time she has been nominated – her previous wins were for “The Lightkeepers” (Comedy, 2010) and “The Wind Gods” (Documentary, 2011). In the non-film categories, composer Christopher Lennertz wins the award for Best Original Score for a Television Series for his bold, exciting score for the rebooted version of the classic sci-fi series “Lost in Space,” while composer Bear McCreary wins the award for Best Original Score for a Video Game or Interactive Media for his thrilling score for the action adventure game “God of War”. Burbank, California-based La-La Land Records is named Film Music Record Label of the Year in recognition of their ongoing excellence in restoring and releasing the most beloved film scores of the past. Acclaimed album producer Mike Matessino receives both Archival Awards: one for his work restoring and releasing John Williams’s classic score for the 1979 Frank Langella version of “Dracula” on the Varèse Sarabande label, and one for his work in putting together the lavish box set of John Williams’s three Harry Potter scores - “Harry Potter and the Sorcerer’s Stone,” “Harry Potter and the Chamber of Secrets,” and “Harry Potter and the Prisoner of Azkaban” – for La-La Land Records. Producer Robert Townson shares the award for Dracula, and album artist Jim Titus worked on both releases. Find out more about the IFMCA Awards and the IFMCA at the official site. FEBRUARY 22, 2018 — The International Film Music Critics Association (IFMCA) announces its list of winners for excellence in musical scoring in 2017, in the 2017 IFMCA Awards. The award for Score of the Year goes to British composer Jonny Greenwood for his score for critically acclaimed period drama “Phantom Thread,” directed by Paul Thomas Anderson, and starring Daniel Day-Lewis. In describing the score, IFMCA member Jon Broxton wrote that it was a “quite masterful score from Greenwood, one which gets deeply under the skin of the damaged, potentially dangerous, but nevertheless mutually fulfilling relationship at the center of the story. The abstract, impressionistic, modernistic textures perfectly capture the torment that both characters at times feel, as well as their willful and often unpleasant personalities. Then, when he opens up his orchestra and performs the Phantom Thread theme with glorious melodrama, or when he writes elegant romantic music for what should be the dreadful finale, the whole thing simply soars”. The score was also named Best Original Score for Drama Film; these are the first IFMCA Award wins of Greenwood’s career, him having previously been nominated for Breakthrough Film Composer of the Year in 2007 and Best Original Score for an Action/Adventure/Thriller Film for “Inherent Vice” in 2014. Composer Alexandre Desplat is named Composer of the Year, him having written at least four outstanding works spanning multiple genres in the past year. His work in 2017 included director Guillermo del Toro’s critically acclaimed monster movie romance “The Shape of Water,” director Luc Besson’s epic space fantasy “Valerian and the City of a Thousand Planets,” director George Clooney’s satirical racial drama ‘”Suburbicon,” and the French-language comedy-drama “D”Après Une Histoire Vraie,” directed by Roman Polanski. IFMCA member James Southall said that The Shape of Water was “yet another from the top drawer of Desplat,” and went on to describe him as “one of the most consistently impressive film composers of the last couple of decades,” who has “managed to be so successful without having to water down his highly-distinctive musical voice at all”. IFMCA member Christian Clemmensen called Valerian and the City of a Thousand Planets a “sonic marvel of extremely intelligent rendering” and an “unparalleled execution of orchestral textures” featuring “composition of demanding complexity.” Desplat received IFMCA Score of the Year honors in 2008 for “The Curious Case of Benjamin Button”. This marks the third time Desplat has been named Composer of the Year, following his previous wins in 2017 and 2014. Composer Michael Giacchino wins two awards - Film Music Composition of the Year and Best Original Score for a Fantasy/Science Fiction/Horror Film – both for his work on the third film in the blockbuster Planet of the Apes trilogy, “War for the Planet of the Apes”. IFMCA member James Southall said that War for the Planet of the Apes was “not just the best film music [Giacchino has] ever written” but that “the manner of the score, the construction of the dramatic narrative, [and] the very deliberate emotional prods … make it stand out as a special achievement”. Composer Benjamin Wallfisch also wins two awards - Best Original Score for an Action/Adventure/Thriller Film and Best Original Score for a Documentary – for two very different works. Director Gore Verbinski’s “A Cure for Wellness” is a Gothic thriller which draws on European classical traditions to generate its creepy atmosphere, while “Mully” is an inspirational documentary about the life of Charles Mully, a Kenyan business tycoon who gave away his fortune to start the Mully Children's Family, the largest children's rescue, rehabilitation and development organization in Africa. Wallfisch’s score blends rich, beautiful orchestral themes with influences from traditional East African music. IFMCA member Ley Bricknell described “A Cure for Wellness” as “totally compelling” with “an overwhelming sense of fear and madness”. Cypriot composer George Kallis is named Breakthrough Composer of the Year for his stellar work writing three enormously impressive scores in 2017: the children’s fantasy “Albion: The Enchanted Stallion,” the historical drama “The Black Prince,” and the Russian fantasy epic “Posledni Bogatyr/The Last Warrior,” all of which impressed members of the IFMCA with their scope and creativity. The various other genre awards are won by Christopher Willis his Russian-inspired music for the satirical comedy “The Death of Stalin”; and Theodore Shapiro for his anarchic but wonderfully sincere score for the animated super hero parody “Captain Underpants: The First Epic Adventure”. In the non-film categories, composers Bruce Broughton, John Debney, Joel McNeely, and Andrew Cottee jointly win the award for Best Original Score for a Television Series for their magnificent work on the Fox sci-fi series “The Orville,” while Spanish composer David García Díaz wins the award for Best Original Score for a Video Game or Interactive Media for his moving score for the adventure–puzzle video game “Rime,” in which players are compelled to solve environmental puzzles across five large levels that represent the five stages of grief. Burbank, California-based La-La Land Records is named Film Music Record Label of the Year in recognition of their ongoing excellence in restoring and releasing the most beloved film scores of the past. British label Tadlow Records and producer James Fitzpatrick are honored with the award for Best New Release, Re-Release or Re-Recording of an Existing Score for their lavish new recording of Miklós Rózsa’s classic 1959 score “Ben-Hur,” which IFMCA member Craig Lysy described as “the most thematically complex and melodically rich film score ever penned by the hand of man” … “a superb recording and the crowning glory of the Golden Age”. Finally, Oakland, California-based Intrada Records and producer Douglass Fake wins the award for Best Film Music Compilation Album for their superb release “Captains Courageous: The Franz Waxman Collection”, a compilation of outstanding themes by the great German composer of the 1940s and 50s. The International Film Music Critics Association (IFMCA) is an association of online, print and radio journalists who specialize in writing and broadcasting about original film, television and game music. Since its inception the IFMCA has grown to comprise over 65 members from countries such as Australia, Belgium, Canada, China, Denmark, France, Germany, Greece, Ireland, Italy, the Netherlands, Norway, Poland, Romania, Spain, Sweden, Switzerland, the United Kingdom, and the United States of America. 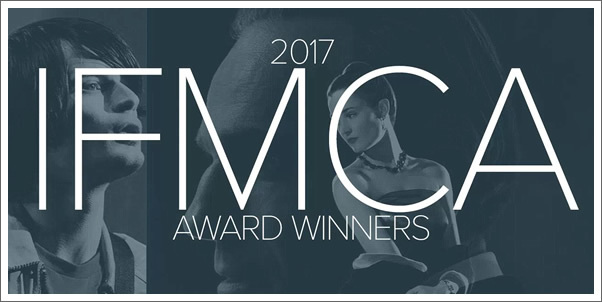 Previous IFMCA Score of the Year Awards have been awarded to Jóhann Jóhannsson’s “Arrival” in 2016, John Williams’s “Star Wars: The Force Awakens” in 2015, Hans Zimmer’s “Interstellar” in 2014, Abel Korzeniowski’s “Romeo & Juliet” in 2013, Mychael Danna’s “Life of Pi” in 2012, John Williams’s “War Horse” in 2011, John Powell’s “How to Train Your Dragon” in 2010, Michael Giacchino’s “Up” in 2009, Alexandre Desplat’s “The Curious Case of Benjamin Button” in 2008, Dario Marianelli’s “Atonement” in 2007, James Newton Howard’s “Lady in the Water” in 2006, John Williams’s “Memoirs of a Geisha” in 2005 and Michael Giacchino’s “The Incredibles” in 2004. For more information about the International Film Music Critics Association go to www.filmmusiccritics.org , visit our Facebook page, follow us on Twitter @ifmca, or contact us at press@filmmusiccritics.org. Recently, we began a brand new podcast, THE ANNOTATOR, which is unlike any podcast we've done before. 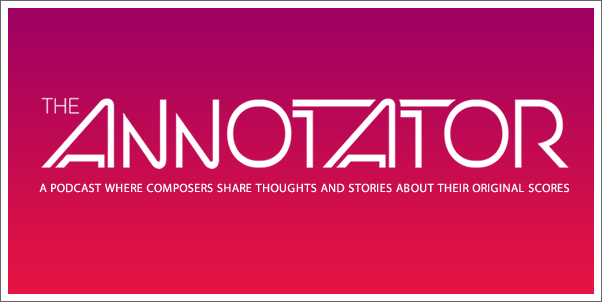 The Annotator focuses on the composer. No interviewer. No answering questions. It's simply the composer telling his or her story about and sharing insights into their original scores. We are two episodes in, but in case you haven't been able to catch them yet, here they are! Hope you will listen and if you enjoy what you hear, let us know and check things out on the official site, TheAnnotator.Net. 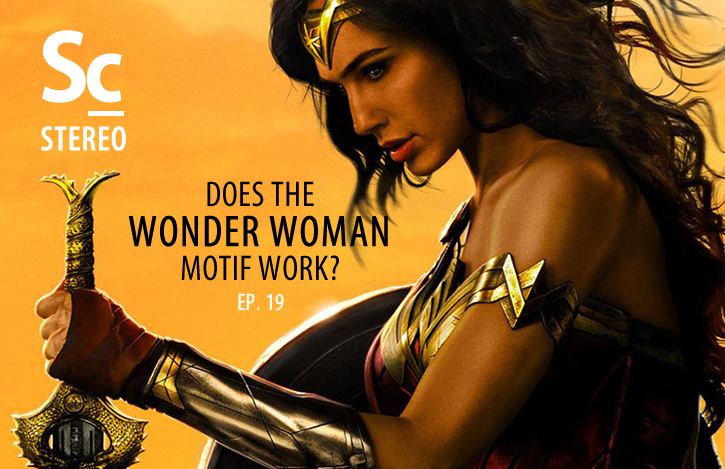 Episode 19 - Does the Wonder Woman Motif Work? Kristen Romanelli and Christopher Coleman tackle perhaps the biggest question surrounding the new "Wonder Woman" film score, "Does the Wonder Woman motif work?" Before doing so, they have a spoiler-laden discussion regarding their thoughts about the film, itself, as well as Rupert Gregson-Williams score, overall. You'll find out just where each of them rank the film and respective score in the DCEU and what their hopes and expectations are for the next film "Justice League." Follow Kristen Romanelli on Twitter. Follow Christopher Coleman on Twitter. Find our Spotify Companion Playlist here! 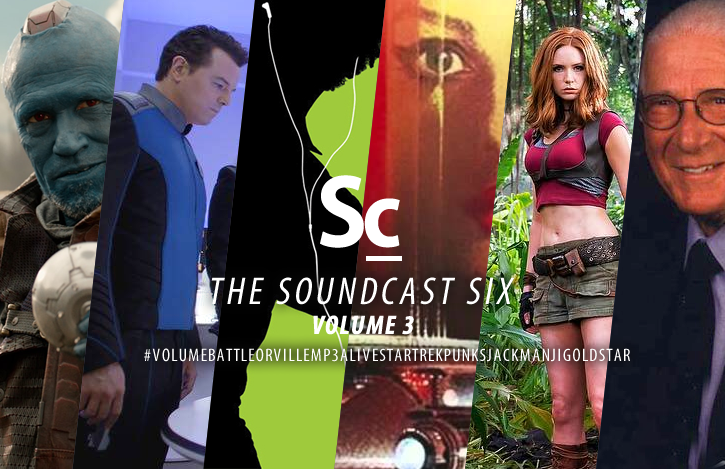 The official podcast of Tracksounds.com, The SoundCast is hosted by Christopher Coleman and features reviews and discussions centered around film, TV, and video game soundtracks. Special edition episodes include interviews with composers and other industry professionals. 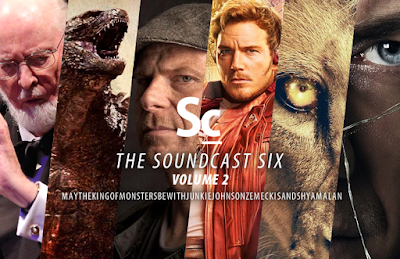 The Soundcast Stereo is co-hosted by Christopher Coleman and Erik Woods (Cinematic Sound Radio). Each episode is a 30 minute (ish), two channel conversation about the world of film, television, and video game music. 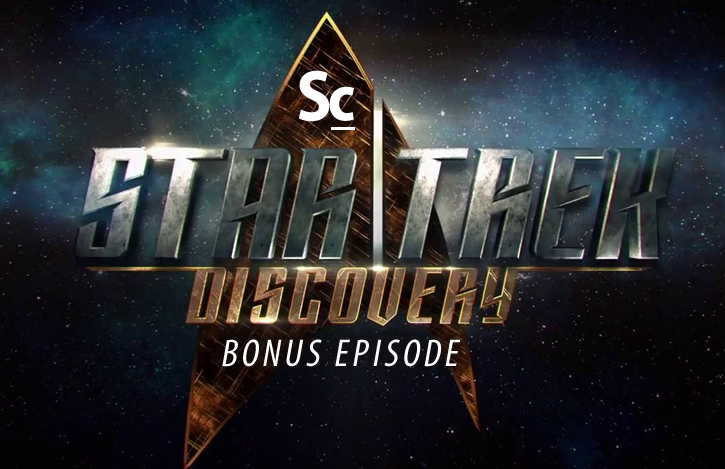 Christopher Coleman, Kristen Romanelli and Erik Woods share their thoughts about the recently released trailer to STAR TREK: DISCOVERY. They discuss the look for show and what may be in store for our ears in the series' music. 05:00 - What Sort of Score? 06:30 - Who Is Going to Watch This? Follow Erik Woods on Twitter. In this volume, Kristen Romanelli, Erik Woods, and Christopher Coleman a new set of six stories from the soundtrack world: The Guardians of the Galaxy Vol. 1 vs Vol. 2 twitter poll, The Orville with music by Bruce Broughton an Joel McNeely, The death of the MP3, The Star Trek; Legacy mashup, Henry Jackman on Jumanji and Jerry Goldsmith finally gettin his star on the Walk of Fame. 34:36 - #3 - MP3: Dead of Alive? 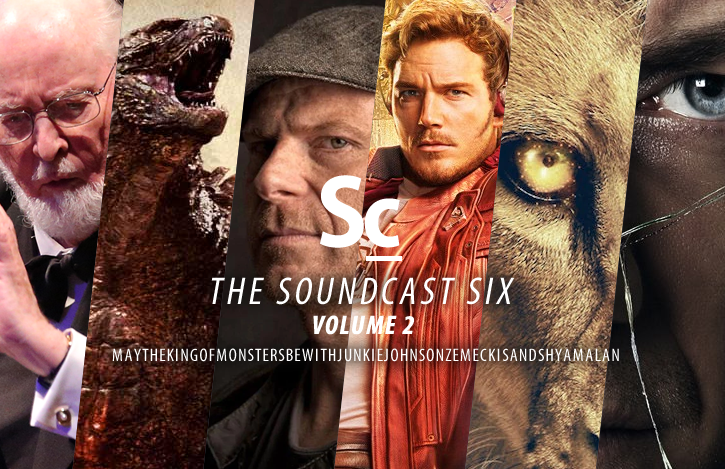 Erik Woods (Cinematic Sound Radio, Kristen Romanelli (Film Score Monthly Online) and Christopher Coleman return to tackle six hot-topics from the world of soundtracks. In volume 2, they talk about: John Williams internet "May the 4th be with You" greeting, the fall-out from the false revelation of Junkie XL (Tom Holkenborg) as "Godzilla: King of Monsters" composer, Junkie XL's recent Youtube video commenting on the disappearance of the "film theme," no CD release for "Guardians of the Galaxy Vol. 2's" original score, the news and speculation of Joe Johnston helming the next Narnia film and Robert Zemeckis joining "The Flash," and finally a discussion of the amazing reveal in M. Night Shyamalan's "Split." 24:11 - #3 - Junkie XL - Where are the themes? Rian Johnson and John Williams' "May the 4th be with You"
GQ - "Junkie XL: The Secret Ingredient in the Best Soundtracks of the Past 15 Years"